Hey, you got your Magic: the Gathering in my Battle Line! 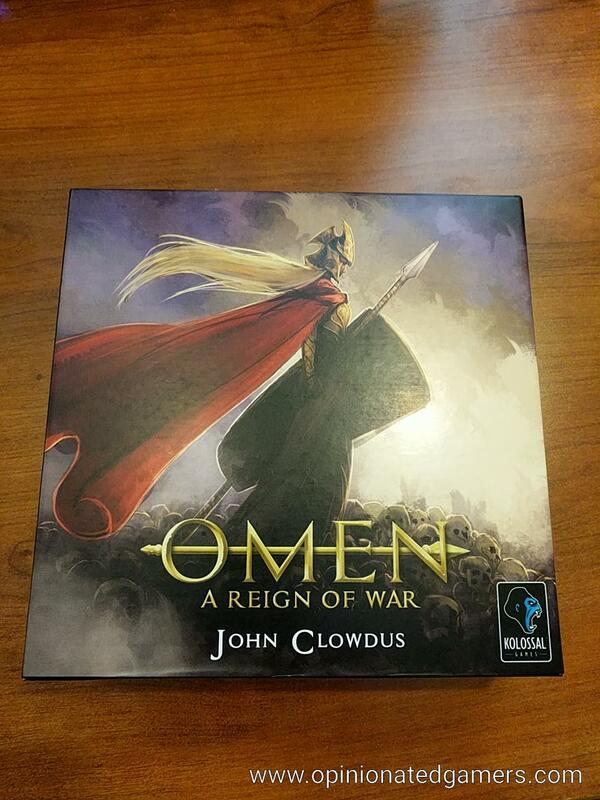 I have been playing a wonderful two player (for now) game called Omen: A Reign of War for the past few weeks. Normally, review copies get played the necessary number of times and the review gets written. I have enjoyed Omen so much that it has gotten fairly steady play. I’ll admit it, I am a conflict-averse gamer who sees multiplayer solitaire as a ‘good thing’. Omen is not that game. It is a vicious fight where you are basically handcuffed to your enemy and have a wide array of weapons at your disposal. Only one will come out of it alive. In a bold move, I am going to dump the rules explanation at the end of the review, so if you want them, they are there, but since I never read rules summaries, and neither does Nate, I’ll change things up. The basic idea is that there are three piles of cities and through six stages per turn, you play cards on your side of the city, gaining/spending cards and coins to get victory points (VPs). In addition, you can use special powers to buff yourself or decimate your opponent. The game ends when one person has completed five feats or two of the three city stacks have been exhausted. At that point, the player with the most VPs wins. This game is awesome because it is brutal. If you favor strategy over tactics, you might want to look elsewhere. Let’s say I offer up a good card at the end of my turn and use it to take coins. Blammo, my opponent plays a card that steals all my money. Hoard cards? Lose them. Place great beasts in a city in preparation for next turn? Killed. The coolness of this in a cardgame is that you are playing your own fears as much as your opponent. Unlike where you play a card to optimize your chances of success, here you are always worried that if you take a certain path, it could be perfect or you might be hit by Clowdus’s Ju-jitsu and your plan will just benefit your opponent. You know they only will have 5 cards or so, but imagine the negative effects of 20 cards you have already seen and might even hold. Just to be clear, many of the cards benefit the active player, so you can definitely make yourself stronger, but by doing that you are not hurting your opponent that round. Hmm. Unlike In the Year of the Dragon, where everything is negative, this game is sort of zero-sum. You will get the joy of victory as well as the agony of defeat. There is a visceral charge when you barely complete your fifth feat and have the points to win or you have the perfect cards to demolish your opponent. It is a roller-coaster, so you need to be able to take the ups and the downs. At this point, you probably know whether this game is for you. My only caveat is to consider who you will be playing it with. Even if you love it, will your opponent love it when you twist the knife? 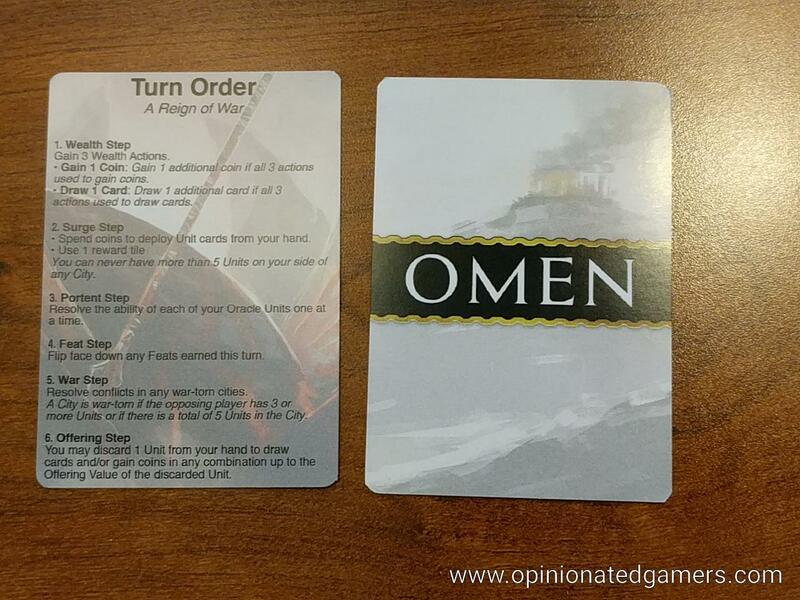 If you imagine yourself playing and cannot see yourself killing all your opponent’s valuable beasts and then robbing him/her blind because it won’t be fun for him/her, Omen might not be the right game for you. I have not played it enough to go tweaking the game, but I would suggest that if someone, you or your opponent, is not having fun and/or feels that they are too far behind to win, that you call the game and start a new one, rather than dragging it out to its bitter and likely, but not certain, conclusion. Remember, it is in your best interest to want them to play the game again – and they might even want to play it again immediately. If you have 30 minutes and want to go at each other in a WWE sort of way, I cannot imagine a better game than Omen: A Reign of War. The illustrations are wonderful. I like and care about art in games. The art in this game is consistent, beautiful, and adds to the tone of the game in a tangible way. I particularly like the impressionistic aspects of the images and the evocative non-formulaic aspect of the backgrounds. The cards would be cool even without the foreground image. 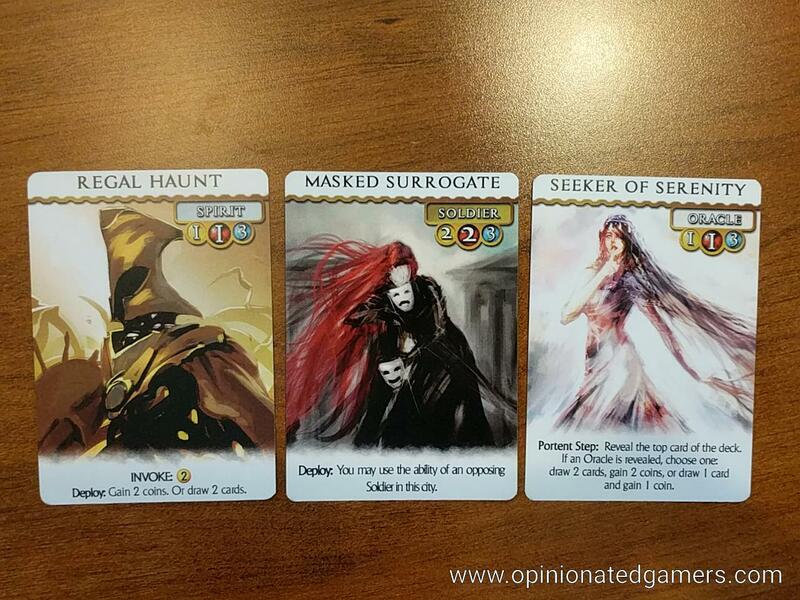 The game has multiple variants including drafting. I have not gotten to that depth yet, but it is cool to know that there are even deeper levels to it if I choose to go there. One of the more interesting points in the Diary is that the expansion was harder to design than the game, as it had to remain true to the game without adding power-creep or breaking the original cards. Something to keep in mind for those who think expansions are just milking the cow. If you are someone who likes to read rules, here you go. There are three stacks of four city cards each between the two of you. They are face down and each one offers a wonderful or not so wonderful special ability when won (more on that later). If you win a city and don’t use its ability, it is worth 2VPs. If you do use it, it is worth 1VP. Each player has an identical set of six feats. These feats are things to achieve during a turn, such as having a solider in each of the three cities, etc. When you achieve a feat (more on that later), you flip it over and it is worth 2VPs. Now that you know how to score, here is how you play. There are six phases. Each player takes all six, then the other player takes all six, alternating until one of the two victory conditions are met, either one player has completed five of his six feats or two of the city piles are gone. The winner is the person with the highest score at that time, not the person who ends the game. 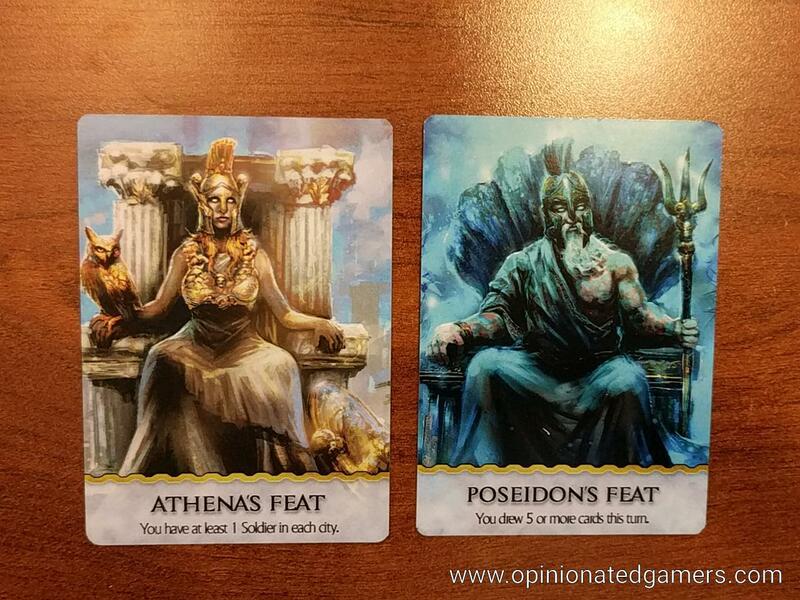 There are two items of value in the play of the game that are used to win cities and complete feats, coins and cards. 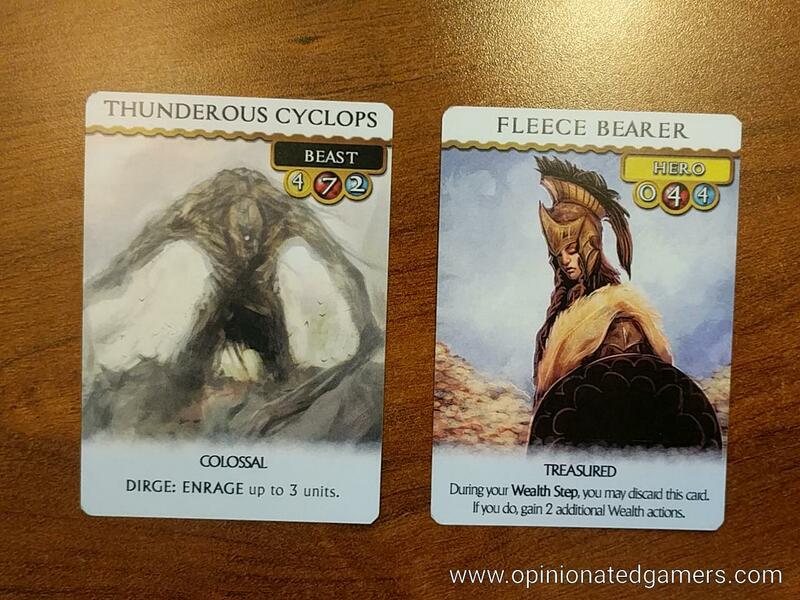 Cards come in three varieties, soldiers, beasts, and oracles. Coins are used to place cards on your side of one of the three cities. Cards support your efforts in those three cities . . . and more! Cards have three values, cost to play (gold oval), offering value (blue oval), and strength (red oval). Wealth phase – Take coins, cards, or a combination of the two – 4 coins, 4 cards, 2 cards + 1 coin, or 2 coins + 1 card. Surge phase – Place cards from your hand on your side of the three cities, paying their placement cost. Soldiers come in with strength and cool special abilities to move cards and do nasty things to your opponent. Beasts force a choice, you can bring them in for their awesome strength or play them to the discard pile for their even more awesome abilities. Oracles are inexpensive and weak in terms of strength, but as we will see, they have awesome benefits in the next phase. Portent phase – Any oracles you have played offer you extra coins and cards. In addition, they can give even more if you flip a card and that card is an oracle. The card you flip is discarded either way, so this action also cycles the deck without having all cards being drawn by the players. Feat phase – If you have completed any feats this turn, you flip those feats face down now. War phase – if any cities have a total of five cards played in them or if your opponent has three cards in a city, that city is at war. Strengths of the two sides are totalled and compared. The winner gets the city card *but* must remove all but one soldier or oracle from that city. The loser, on the other hand, gets to keep either one beast or two soldiers or oracles in the city. So the loser has greater strength in that city for the next war there. Offering phase – You may sacrifice one of your cards for its offering value, taking that many cards, coins, or a combination. That is pretty much it. Six easy phases, of which only two take more than 30 seconds time. Dale Yu: The new version gave this game some new life. Primarily because I had traded away the original version a few years back, and given a chance to play the game again, it is a nice tight 2p game. And one that I’m glad to have back in my collection! In multiplayer games, I’m generally not one for such direct combat, but in the 2-player arena, it makes sense. The game is very fast-paced, and it has been the sort of game that the loser usually calls for an immediate rematch in order to avenge his loss. 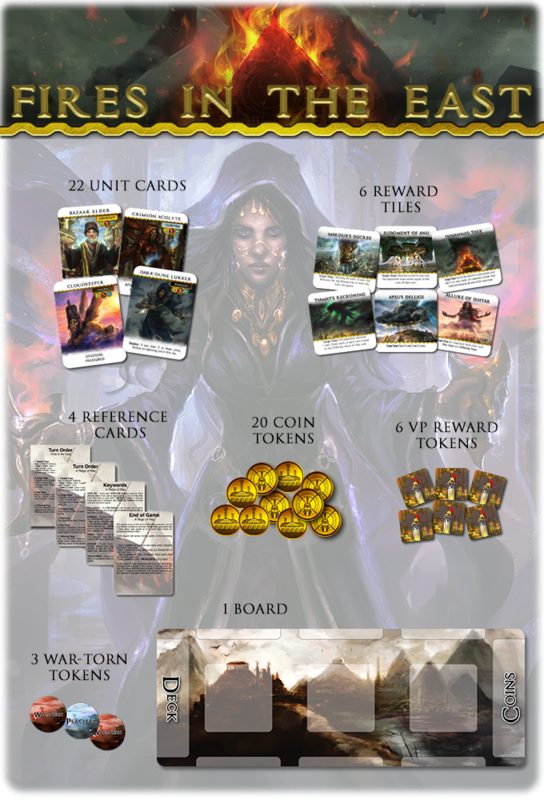 I cannot comment on the quality of the final components as I’m playing with a pre-production version, but I do love the current art and card layout. The fantastic are is the same for the cards, though the card layout is cleaned up a bit (IMHO with improved playability) and the card font is somewhat easier to read. A review of the Kickstarter campaign shows that there are also some expansion/extra sets on offer as well, but I cannot comment on those as I only have the base game (A Reign of War) to play now. This entry was posted in Preview. Bookmark the permalink.